Everything Is Art: Painting of the Day: "Box of Sixty Four"
Acrylic on Panel, 42" by 64"
The nostalgia that hits you when you open a box of crayons. That smell that drifts out of the carton box. All those colours, which to choose? That's what I think of when I see this painting. I used to have a box of 72 crayons. It was one of those special editions that Crayola put out that came in this red plastic box with a handle for the kid to tote it around. Let me tell you, that box showed the ugliest side of me. I was so selfish and possessive over that box of crayon that when it came to colouring time, I would boast to everyone that I had so many colours, but I would not share. Needless to say, all my classmates left me by myself but it didn't seem to bother me much as I would colour pictures in my own little corner of the classroom. I've changed now, I'm much more willing to share and not so possessive. But I still have that box of 72 crayons in its original red plastic box. I think those of us who used to draw with crayons when we were kids all have our own little story of how crayons were special to us. 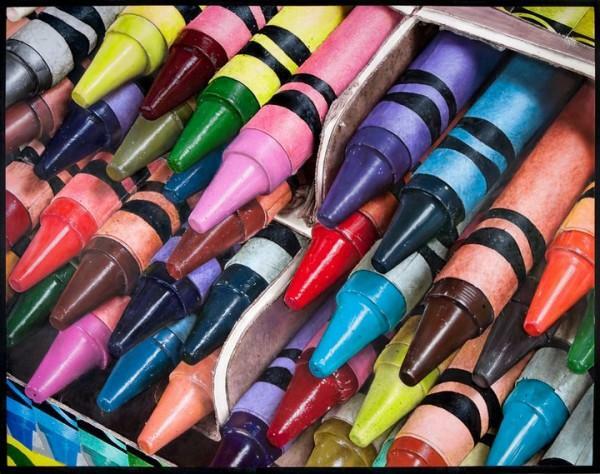 Crayons are a symbol of childhood– the many colours there were, the many happy times one has had. And let's all be honest, Cesar Santander did a pretty darn good job in painting the above painting, no? The colours are very true to life, and the lighting reads very well. Although I'm not quite sure of the lower left hand corner of blue-green. It's the box, I know, but I kind of think it'll be better if it were neutral or black. In any case, it's still an excellent painting and I applaud his ability to portray a scene so realistically.